Free Chicken Salad @ Zoe’s Kitchen. 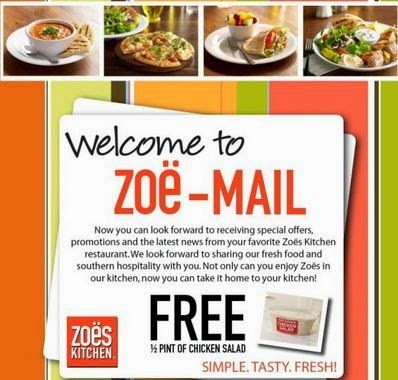 Join the Zoë-Mail list to receive a coupon in your welcome email good for a FREE half pint of chicken salad. Note* One time use only. Print or flash this email on your phone to redeem. Offer expires 14 days from date sent. Click the link below to join Zoë-Mail.